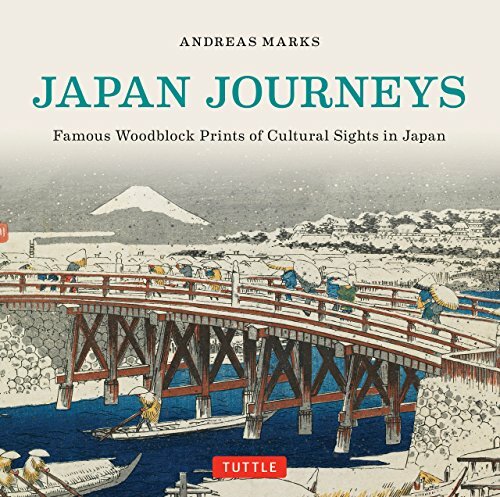 Japan Journeys is a lovely book featuring woodblock art from the 19th and 20th centuries. That's also a period of time when Japanese started to travel more. This 168-page hardcover offers a glimpse into the lifestyle of the Japanese back in those days using the predominant visual media of that time, the woodblock. The artworks look really beautiful although there's some degradation due to how old some of those pieces art, but most are restored quite well. The book claims there are 523 pieces of artwork but I see that each page has only either one or two pieces featured. There are works from famous woodblock artists such as Utagawa Hiroshige, Katsuhika Hokusai (famous for The Great Wave), Kawase Hasui and many more. What's interesting about the book is you get to see the traditional lifestyles of the Japanese back in those days, how life is like on the streets. There are scenes of hot springs, blossom viewing, kimono, tea-drinking, sumo, kabuki, geisha, Japanese bridges, mountains, festivals, temples, buildings and many more. Most artworks are printed across the length or height of the book. They look great. The composition, subject matter are captured wonderfully. The accompanying captions also provides insight to the images. If you have visited Japan, you may probably recognised a few familiar sights, such as the temples or architectural details that have remained the same over the years. The places featured are Tokyo, around Tokyo, Hakone, Mount Fuji, Kyoto and a handful of other sights around Japan. One thing that's missing is they didn't talk specifically about how this woodblocks are made, and how the prints are coloured. I'm impressed by many of the artworks that almost resemble pen and ink work with that high level of details. Amazing. It's a good book for those who want to check out woodblock prints or sights from past Japan.